I am on day number 4 of my weight loss journey and it’s been going good so far. Well, except for when my husband wanted to make Tacos. I wasn’t sure I was going to be able to handle it so I thought of a solution and made a Broccoli Taco Bowl and it worked perfectly! I mean, it wasn’t “Tacos” but it was delicious and I actually really enjoyed it! So then today I was craving something sweet and delicious but had to be careful what I ate or drank. I’m really determined to lose this weight — I am down 6.3 pounds as of today!!! (you can check out my start weight and “before pictures” here) but still love food and love a little treat now and then. For some strange reason I started thinking about how good a Sonic Cherry Limeade would be and how I could totally go for one like RIGHT NOW. I started blabbering to Joe how I was just going to make my own. 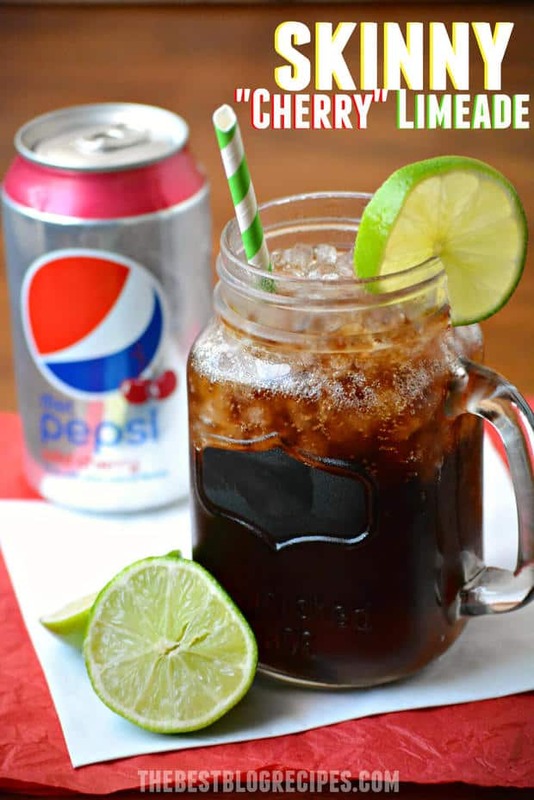 Since I can have diet soda on my weight loss plan I thought about using Diet Sprite, Cherry Syrup and a fresh lime squeezed in it, but then I remembered that I couldn’t have the syrup and was totally bummed out. Joe must have known I needed this drink because not only did he get me some Diet Wild Cherry Pepsi but he also stopped and picked up some of my favorite crushed ice, you know the kind that is in little balls just like Sonic! Yeah, he earned some serious brownie points today! This crisis was adverted thanks to his creative thinking! I know technically this isn’t a Sonic Cherry Limeade but it works while I’m on my weight loss plan, the Medifast 5&1 Program so that works for me. It was really good after a very long day and I will definitely be making this again even when I’m not trying to lose weight! 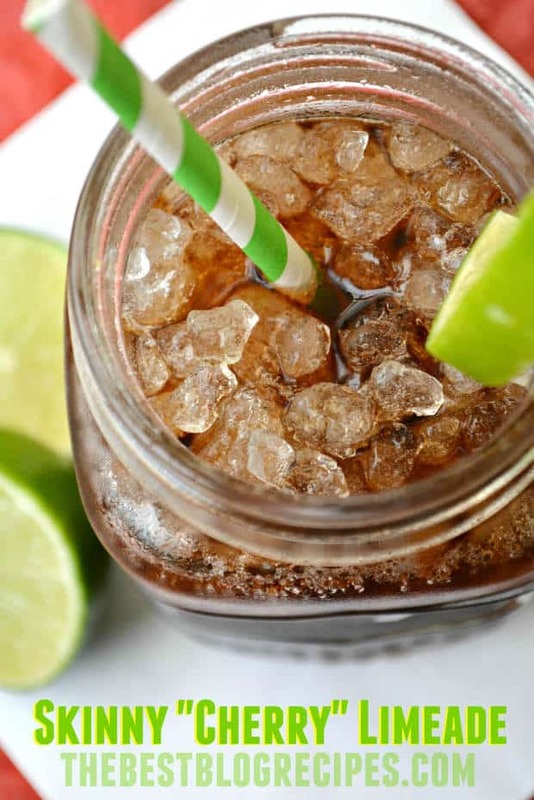 Try this Skinny Cherry Limeade for those days when you need a sweet treat but still want to stay in-line with your weight loss goals! 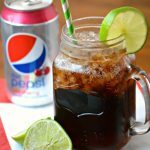 Super simple... just add your Diet Wild Cherry Pepsi, crushed ice and your lime juice to a fun glass. This would be considered as 2 "condiments" on the Medifast 5&1 plan! You can sign up to receive my Weight Loss Journey Newsletter that will have my weekly pictures, the progress I’m making along with healthier recipes that I’ll be eating throughout this process. Thanks everyone for your support in this! Can’t wait to show you what I can do and how much weight I can lose! Super easy and way better than going to Sonic! It is super tasty! Thanks! I’ve only done limes, but I could try lemons too! Thanks Erin! I definitely enjoyed it! I totally agree. But there are still a few things that help hit the spot so that I can keep myself working towards my goals! Looks so delicious and refreshing! It’s awesome you are finding alternative ways to stay on track. It’s so hard when everyone in your house is eating your favorites and you can’t have it! Good luck! Great way to improvise and get what you were craving! Sounds refreshing and wonderful! Love this idea. Have you only tried this with lemons? My husband loves Coke with lemons. This sounds like a wonderful drink. Will have to give this a try. Well done on the weight loss Shauna! 🙂 This sounds like the perfect treat to satisfy those sweet cravings! This sounds delicious right now! I’m glad you’ve found a way to enjoy your favorites without compromising your diet! This looks so good! Great pictures. Looks like a tasty drink! Good luck on your weight loss journey! You’ve got a keeper there… What a great husband! I’m usually not a big Pepsi fan but I do love Sonic’s Cherry Limeade so I’m going to have to try this.